You may not realize just how many types of fencing there are until you start trying to choose one for yourself. Some provide more privacy, and some provide style elements to complement your home. Ultimately, you should choose fencing material based on your purpose for putting in a fence. A chain link fence, for example, won’t provide much privacy, and a wooden fence may not match the style of your home if it’s too rustic. 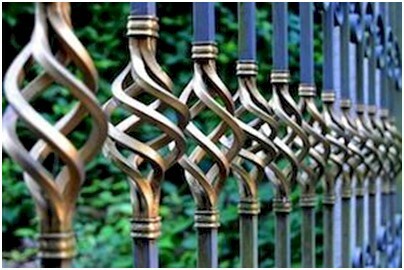 Popular types of fences include aluminum, wood, PVC, wrought iron, vinyl, chain link, electric, bamboo, and farm. Fencing types vary in price and ease of installation, and some require more maintenance and upkeep than others; for example, many homeowners choose vinyl fencing because it requires far less maintenance than wooden fencing. Be aware that the height of your fence will change your price drastically. Another thing to keep in mind is that some fencing is more durable than others, and a pricier fence may be more durable and save you money in the long run. When choosing a fencing material, you also want to think about what the fence will look like a few years down the road. Vinyl fencing virtually is maintenance-free and resists paint and stains, and it is easy to scrub with a hose and soap. Wooden fences, on the other hand, need to be stained or sealed or painted every couple of years and often require some sanding beforehand. Vegetation also grows on wooden fences more easily than on vinyl fences, and wooden fences have been known to be a hotspot for mold or mildew growth. Even though your fence will be outside, if you do find mold growing on it, you should contact a professional to remove it. Mold spreads quickly and can cause health issues such as headaches, cough, fatigue, eye irritation, headaches, and rashes for people who come into contact with it. Professional mold removers have the equipment and the know-how to eradicate the mold and make your yard a safer place for you, your family, and your pets. When designing and measuring for your new fence, don’t forget to plan for gates. If you have a large yard, you should consider including at least two gates in your fence to provide easy access to other parts of your property. Some homeowners prefer to place gates at the side and front of the fence for getting to their front and side yards more easily. Others only want one gate to add security. No matter where you choose to place your gates, you must plan for solid hinges. Your gate will be heavier than you think and people often place a great deal of pressure on them when opening and closing them. Kids also are prone to swing on gates. That’s why you need to avoid undersizing your hinges and ensure you place your gate on posts that are much deeper in the ground with more cement around them. Keep in mind that wooden gates especially can be heavy and absorb water when it rains, making them even heavier. Your best bet is to talk to an employee at a home improvement store or hardware store and make sure you are matching the hinges to the amount of weight they will hold. Many homeowners find that installing a fence is a manageable DIY project, though a labor-intensive one. If you want to install a fence, be sure to consider which fencing material is best for your area and purpose, the future maintenance needs of your fence, and the location and required hinge sizes of your gate. Can you please suggest some tips for Maintenance of Vinyl Fence? My wife and I have been thinking about installing a new fence for the kids in the backyard but we aren't sure where to start. I like that you suggest adding leaving room for a gate in your design. We have a pretty large yard too so we might have to plan for two like you said. Thanks for sharing! My wife and I are thinking about building a fence in the backyard for the kids but we aren't sure where to start. I like that you suggest including at least two gates in your fence to provide easy access to other parts of your property. We'll be sure to find a spot for these before we start planning. Thanks for the tips!